Why clean my Solar Panels? Solar panels work by allowing light into the solar cells, the more light that gets in the more power it will generate, the panels are normally installed at an angle to make them more efficient, this does however make them prone to a build up of dust and dirt that does not clean itself with just rain, then if you take into consideration other elements like bird droppings etc this can have an extremely detrimental effect on the returns you are expecting from your own PV system. 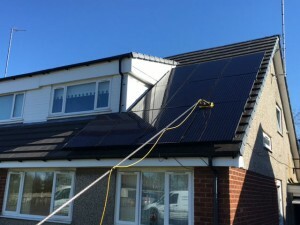 It has been proven that you can be losing between 20-40% of your generation by not cleaning your solar panel system in a normal residential area, in a dusty commercial type premises you can lose even more where a 60% reduction in performance has been lost due to conditions affecting the system.